Our company is based on the belief that our customers’ needs are of the utmost importance. Our entire team is committed to meeting those needs, and as a result, a high percentage of our business is from repeat customers and referrals. Our core competency is our industrial sewing to create custom carrying cases, bags, pouches, straps, leashes, outdoor gear and backpacks that meet the special needs of our clients. We are in business to be your loyal sewing partner, delivering high quality goods in a timely fashion. Combined with our team of experts, our manufacturing technology enables us to offer very competitive pricing for the highest quality work. Our clients range from small business owners and inventors to national corporations and government contractors. We would welcome the opportunity to earn your trust and deliver you the best on time quality service in the industry. PALOUSE – How would you like to sew up a job? Well, if you can actually sew, Linda Daggett may be able to put you to work.”They need to know how to sew,” Linda said of potential independent contractors. “They need to be reliable. They need to pay attention to detail. They need to be available.”And, they need a commercial quality sewing machine – about a $3,500 investment. 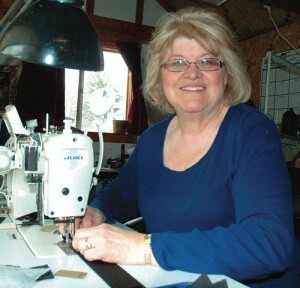 Linda co-owns, with her daughter-in-law Michele Daggett, a sewing business called Dagwood Designs. The two virtually stitched the business together, with Linda working on the east side of the state and Michele working out of Vancouver on the west side. “At times we are so busy,” Linda said, “that I literally work 20 hours a day.” So do about 15 current independent contractors who, through Linda and Michele’s business, do piecework mostly for government and military entities. Oh, and don’t forget the dog leashes. Linda works in her home, as do most of the independent contractors. Actually, she works in a cottage-like shop located behind her home in this Whitman County town. She’s surrounded by a fleet of about six sewing machines, including an antique Singer that works but is mostly for conversation, and one ultra heavy duty beast that’s powered by an air compressor. “What really brought us to realize we had to get other people to help,” Linda recalled, “was when we got an order for 270,000 knife sheaths.” So she advertised. But there have been few takers recently. Linda speculates that people hesitate because the opportunity sounds like one of those get-rich-quick-while-staying-home pitches. She’s not promising fortune. But she does all but guarantee a job worth the effort. The various products are done in assembly line fashion – with Linda maybe sewing the first pieces together. Then they’re sent to another person for more fabrication, maybe another after that, and then back to Linda where the finished products are shipped. UPS and FedX trucks come to her house nearly every day. Linda was born in Garfield, moved with her family at the age of 10 to Pullman, graduated from high school there in 1965 and “left as soon as I could.” She married (her husband died several years ago), had a couple children and lived mostly in St. Helens, Ore., before deciding the Palouse looked better than ever. “I just decided you know what, I’d come over here and visit my son and I just felt good.” So she stayed … and sewed herself into a close knit community where her business continues to thrive. “I work fast. And I work good. And I work hard. And I can make good money.” She doesn’t do garments, alterations or repairs. Her prowess, which her other independent contractors share, is grinding through a job and delivering the product that’s ordered. In the meantime, other jobs keep piling up and Linda said she’d welcome calls from people who know how and want to sew. Her phone number is (509) 878-1649.